are available at Grill-Repair.com for every barbecue grill ever made! Factory direct parts, after-market grill parts and universal adjustable grill parts are all available through our South Florida distribution. Our service technicians work seven days a week servicing, repairing and cleaning any make, any model of barbeque grill. We replace burners, cooking grates and igniters. 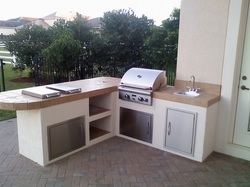 The links on the right side of this page are links to additional information regarding barbeque grills, grilling information, repair techniques and bbq grill parts for repairs.